During the late hours of April 17th, something hurled a plume of hot gas over the eastern limb of the sun. NASA's Solar Dynamics Observatory photographed the splash: The source of this activity was probably returning sunspot AR2644. Now, following a two week trip around the farside of the sun, AR2644 is due to return. 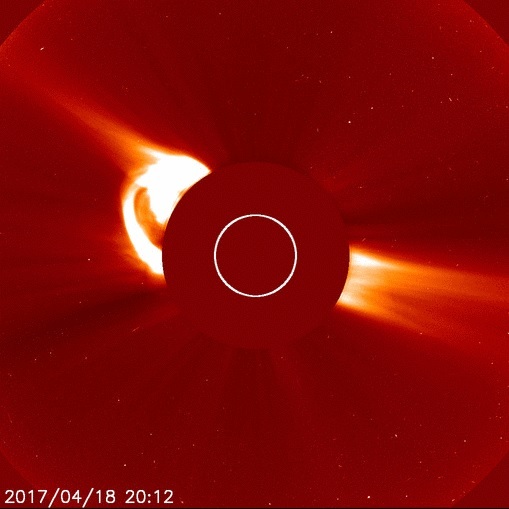 It looks like it's returning with much of its old potency: Spacweather.com reports; Old sunspot AR2644 has returned--and it is still active. The ESA/NASA Solar and Heliophysics Observatory caught the cloud as it raced away from the sun. This CME will probably miss Earth. The explosion's epicenter was too far off the Sun-Earth line for a direct hit. NOAA analysts are still evaluating the possibility of a glancing blow, however, so stay tuned for updates. More CMEs may be in the offing. In early April this sunspot produced a series of strong M-class flares and shortwave radio blackouts on Earth. Geoeffective activity stopped only when the sunspot went into hiding on the farside of the sun. Two weeks later it's back, and it is turning toward Earth for a new round of solar activity. A mountain size near-Earth asteroid discovered nearly three years ago flew VERY CLOSE past Earth today at a distance of about 1.1 million miles (1.8 million kilometers), or about 4.6 times the distance from Earth to the moon. Although there was no possibility for the asteroid to collide with our planet, this will be a very close approach for an asteroid of this size. The asteroid, known as 2014 JO25, was discovered in May 2014 by astronomers at the Catalina Sky Survey near Tucson, Arizona -- a project of NASA's NEO Observations Program in collaboration with the University of Arizona, see video.